I was surprised to hear that many teachers are still unaware of the research panel offered within Google Drive. The research panel allows for students to perform research when using Google Docs and Presenter without ever having to leave the Google Drive environment. 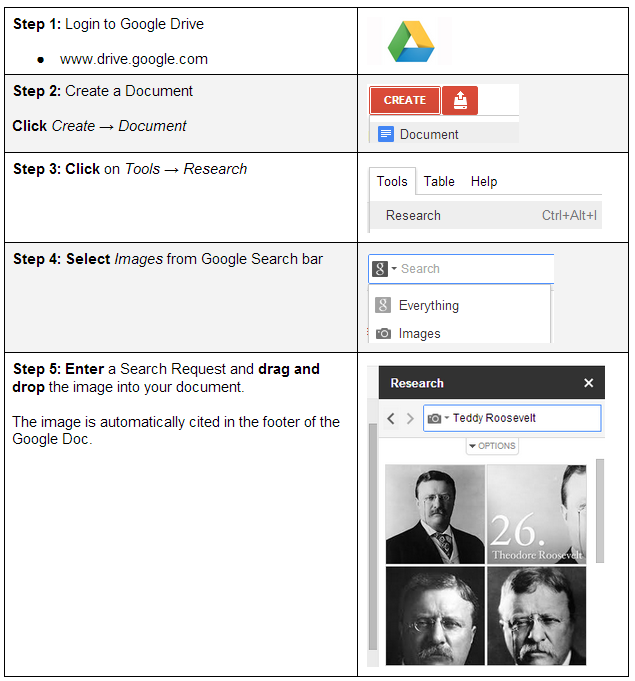 For example, if I were doing a research paper on Teddy Roosevelt's administration I could easily do an image search by clicking on the Tools -> Research menu. This launches the "research panel" allowing for me to type my query within the document or presentation without ever having to open a new tab. Once the images appear in the panel, I can choose the one that appeals to me and simply drag and drop the photo anywhere in the document. Best of all, the images I choose are automatically cited in the document footer (MLA, APA, or Chicago). Below are directions explaining this process.